Nottingham City Guitars operates from a purpose built workshop & showroom, just off Hockley in Nottingham's historic Lace Market. We have a great range of quality vintage guitars Fender, Gibson, Guild, Gretsch. Stocking cool hard-to-find gear, including UK built hand wired Cornell valve amp's, boutique & vintage pedals, James Trussart Custom Guitars, Rickenbacker, MasteryBridge, Effectrode Audiophile pedals, Bare Knuckle Pickups, Bigsby, strings and all the usual suspects. The workshop undertakes set-ups, structural repairs, re-frets, refinishing, nuts, wiring, hand wound pickups, rewinds - Just ask ! Please view our website for more detail & photo's. All our guitars are inspected, set-up and sold with a full 12 month guarantee. Major credit cards accepted or payment by bank transfer. We are a UK based bricks & mortar retailer. CITES compliant. Open Monday - Friday 10 - 16.30 & any reasonable time by appointment, including weekends. Found your dream guitar but how do you get it home ? We ship world wide, fully insured, at customer’s expense. Mainland UK deliveries by reputable courier can usually be delivered within two working days. Rates vary, please call for a quotation. We are happy to securely pack instruments to be collected by the buyer’s own courier. We will also make personal UK deliveries, where time is not critical. Please phone or email to enquire on delivery options. Payments must be received in full cleared funds, in Sterling, before goods are shipped. We will only ship to the Reverb approved address. We do not accept Paypal. International customers please note All VAT, taxes, duties or other charges, CITES fees & licences related to import and shipping are the responsibility of the buyer. Please be very wary of airlines and airport security. Do not take for granted any reassurances on safe transit or permission to carry on board. This is usually the ultimate decision of the airport security operators and not the airline. CITES - where CITES rules are imposed on any guitar we will comply with the Law in the UK and provide all necessary documentation and export permits required for the instrument. It is the buyer's responsibility to ensure that all necessary permits are obtained for import in to their chosen shipping country. CITES rules are applied internationally but administered differently in different countries, particularly with regard to licences for import & export. It is the buyers responsibility to pay all CITES fees for importation and advise of the port of entry required for their country. If in doubt ask !! Special conditions take precedent over Reverb General Terms & Fees and Charges. All guitars come with a 48 hour approval period. "As-Described" is a guide only, buyers should rely on photographs supplied. The approval period is for the buyer to make sure that the guitar is in satisfactory condition and authentic. Returns will not accepted because the buyer doesn’t like the way an instrument plays or sounds or other personal preferences. The buyer must notify us if they want to return the item within 48 hours of receiving the guitar. All returns must be approved by us. Upon safe return of the guitar in its original condition we will refund the purchase price minus any Customs, card, exchange rate or finance costs. Shipping expenses, CITES fess & Customs / handling charges will not be returned. All Customs charges payable on goods re-entering the UK are the responsibility of the buyer. We do not charge and cannot recover VAT. CITES licences are the responsibility of the buyer. Refunds can only be made by the original method used to pay for the goods. All Goods returned, including those under Distance Selling Regulations, will be at the customer’s expense. Outbound costs incurred will not be refunded whether the guitar or goods were shipped free of charge or otherwise. All returned items must be insured at their full value at the customer's expense and remain the customer’s responsibility and risk until received in good order by Nottingham City Guitars. Instruments that have been altered, tampered with or damaged cannot be returned. Instruments cannot be returned as faulty or defective where a specific defect was previously advised to the customer at or before the point of sale. 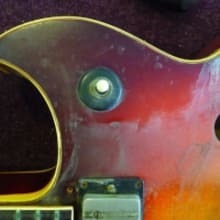 Defects and wear in wood, paint and metal finishes, frets and finger boards are to be anticipated and likely with pre-owned instruments and such defects will not be acceptable as reason for return. We would prefer all customers to inspect and play their chosen instrument before purchase. CITES - where CITES rules are imposed on any guitar we will comply with the Law in the UK and provide all necessary documentation and export permits required for the instrument. It is the buyer's responsibility to ensure that all necessary permits are obtained and pay the cost of permits for import in to their chosen shipping country. CITES rules are applied internationally but administered differently in different countries, particularly with regard to licences for import & export. It is the buyers responsibility to pay all CITES fees for importation and advise of the port of entry required for their country. If in doubt ask ! !